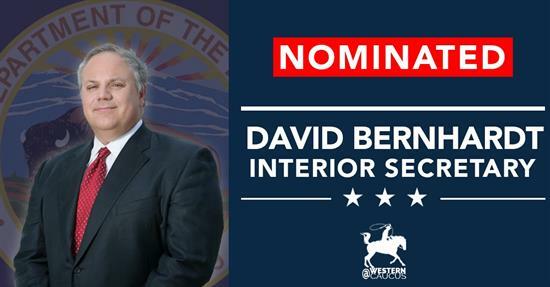 WASHINGTON, D.C. – Today, members of the Western Caucus released statements of support for David Bernhardt's nomination for Secretary of the Department of the Interior. Senate Committee on Energy and Natural Resources Chairwoman Lisa Murkowski (AK): "I strongly support David Bernhardt to serve as the next Secretary of the Interior. He already has helped the Department accomplish a great deal for Alaska and the nation, both as deputy secretary and as acting secretary, and he is more than capable of leading on a permanent basis. I will schedule a hearing and seek to move his nomination forward as expeditiously as possible. Vice-Chairman for Indian Affairs and Oceans Don Young (AK-At Large): "I was very fortunate to meet with Acting Secretary David Bernhardt last week, and was impressed by his great knowledge on issues important to Alaska. Mr. Bernhardt is an honest, hardworking man and a tremendous asset to the Department of the Interior. It is imperative that the Senate swiftly confirm him as our next Secretary of the Interior. I wish Mr. Bernhardt the best of luck throughout the confirmation process, and hope he remains resilient against attacks from organizations that oppose responsible land use and resource development.